- Many fans are concerned about Michelle in light of her having lost one of her best friends. Michelle has been greatly saddened. But she is strong. She and other friends of Anita's have been working on arranging all the services for Anita. They spent the New Year Eve with Anita. A public memorial service is scheduled for January 11th and the funeral will be on 12th. Michelle and Anita were very close friends. It seems like yesterday that Michelle stood right behind when Anita vowed to fight with the cancer (News Sept. 5). Michelle went to support Anita during her concerts last month. She's still wearing the crystal bracelet Anita gave to her. I recall when Michelle formed Mythical Films, some reporters asked Anita if she would work with Michelle for her (Michelle's) new company. "If she needs me, I would do it even without getting paid", said Anita. - Anita Mui, famed Hong Kong pop diva and actress, passed away at 2:50AM, December 30th, in the Hong Kong Sanatorium & Hospital. She was 40. Anita had been fighting with cancer. She was the former president of the Hong Kong Performing Artists Guild (HKPAG). Many Hong Kong artists and Anita's friends, including Michelle and Jackie Chan, went to the hospital last night before she died. A brief news conference was held by her friends at the hospital around 4AM. - Site updates: Two new sections in Gallery: "Michelle & Her Fans" and "Magazine Photos & Articles". Many THANKS to Cass, Steve, Dean, Yuki, and Sheryn who contributed the stories and scans! The "Biography" and "Q & A" have been moved to a newly created Introduction section which also contains a Site Map. - A picture of Michelle at the opening of Mandarin Oriental, New York, December 1st. - Silver Hawk Official Site updates: new trailer (the Cantonese version has English subtitles), photo gallery, wallpaper, and behind scene video clips (in "Breaking News"). - On Saturday, 13th of December, Michelle attended the "My World in My Eyes" Exhibition in Hong Kong. Photos taken by 100 children from Xinjiang (one of the poorer regions in China) were displayed. Michelle, as the "Love, Faith, Hope" Goodwill Ambassador, together with some school students, collected school supplies which will be sent to children in Xinjiang. Michelle revealed that she plans to visit Xinjiang with a group of Hong Kong students in July so they can learn about how poor students live and cherish what they have. Also attended the event were Cherie Chung, Maggie Yeung, and Michelle's protege Brandon Chang. - Photo at left: Silver Hawk comics. For more news about the comics series please see Silver Hawk section. Also added are more photos from the promotion on Dec. 7 - including a few when Michelle prevented the accident. - Notes on the Crouching Tiger, Hidden Dragon Prequel: production won't be expected soon. - Hua Mulan: script problem. - No. 1 Flying Person of Asia, Blackie Ko Sau-Leung, passed away. More news on Silver Hawk page. Ko's stunt team participated in the filming. 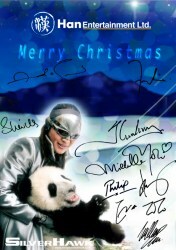 - In Silver Hawk: report and photos from Hong Kong promotion, December 7th - Michelle the REAL Silver Hawk! - Busy Michelle: Michelle had been in U.S. for a few days for film related business. Also on December 1st, she was one of the celebrities who attended the grand opening gala at the Mandarin Oriental, New York. Upon returning to Hong Kong, on December 6th, Michelle was invited for a special golf game during the Omega Hong Kong Open golf tournament. The special game, named "Double Eagle", was for promoting Omega Double Eagle new watch series. 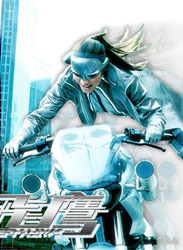 Michelle and Richie Jen formed a team that is called "Flying Eagle" (the Chinese title of Silver Hawk). Michelle did very well in the game but Richie Jen, who said he had no time to practice (but he majored in Golf when he was in college!) did poorly. They didn't win. - I've created a Mailing List for the Michelle Yeoh Web Theatre. You're all welcome to sign up. Please note that it is an announcement list, not a discussion list. It will only be used occasionally for important Michelle related matters - such as Michelle film screenings, opportunities of meeting Michelle or sending group greetings to her, etc..
- A drawing of Michelle from CTHD is added at Fan Arts section. Thank you, Don! - This is not new, just in case you haven't seen... Kevin (thanks!) found us this Madame Tussaud's page which has two links - 21st September and 19th January of 2001 - to some interesting photos and stories. - Hua Mulan: director unfixed? - AP published a correction on the MTV Style Awards Story (see related links in News of Nov.29). The actress who had violet hair, pink fur coat and metallic mini skirt was not Michelle (isn't it obvious from the photos?) but the HK actress Sandra Ng (Wu Junru. Michelle's co-star in Holy Weapon). - Michelle was awarded as International Actor of The Year at the 2003 MTV & SMG Style Awards in Shanghai, November 29th. Awards were given out in 37 categories in film, music and fashion industries around Greater China and Korea. Li Bingbing, Michelle's co-star in the upcoming film Silver Hawk, won Actress of The Year (Mainland China), and Carina Lau won Actress of The Year (Hong Kong). Famous basketball player Yao Ming was awarded Sportsman of The Year. More than 100 celebrities including Jiang Wen, Feng Xiaogang, Stanley Kwan, He Ping, Coco Lee, Karen Mok, Sandra Ng, Edison Chan, etc. attended the ceremony at the Shanghai Grand Theatre. The gala also celebrates the anniversary of Shanghai?s successful application to host the 2010 World Expo. - Redesigned Silver Hawk Official Site is now fully open. - "Variety" reported that Michelle was an award presenter at the CineAsia, the major convention and trade show for the Asia/Pacific motion picture theatre industry, held in Bangkok from Nov. 18th to 20th this year. At the previous CineAsia awards, Michelle was awarded "Producers of the Year" in 2002 and "Excellence in Acting" in 1999. - Reportedly Michelle will attend the Style Awards 2003. The ceremony will be held by MTV and SMG on November 29th, Shanghai, China. - Italian International Film (IIF) has acquired Italian distribution rights to Silver Hawk. - Silver Hawk: sales and distribution information. - Photo at right: Michelle with singer and actress Cally Kwong at The Spa By Valmont opening ceremony, November 9 ("Wenwei"). - Hua Mulan: update on other reported Mulan films. - The first trailer of Silver Hawk is here! See Silver Hawk page for a download link. - Hi all, a report on our special birthday gift to Michelle is here, finally ;-). 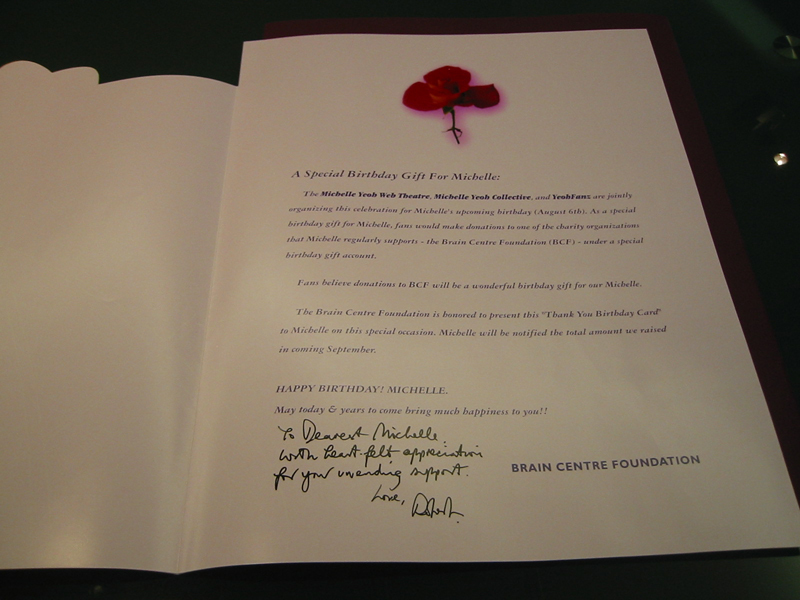 Jacqueline of BCF informed us last night that a "thank you certificate" and a donation report had been sent to Michelle. 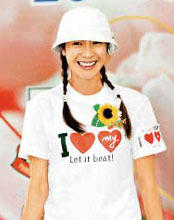 Please see the special report: On Michelle Yeoh Birthday Special 2003. There are also two survey polls on that page. I would really appreciate it if you could spare a few moments to take the survey. Thank you! - Video: Michelle at the CABLE TV celebration, October 31st. (3MB RealMedia, 0:44, in Mandarin and Cantonese). Many thanks, Frida! Michelle said that she's currently working on the post production of Silver Hawk, which will hit screens around Chinese New Year. "Hope you will support me," said Michelle with a smile. Asked about Anita Mui's health condition, Michelle said she just called Anita a day ago and she's doing well. When asked about the cast for Hua Mulan, Michelle said they are still working on the script and the casting won't start until the script is fixed. Left photo: Hugo Boss party. with Thomas Chung and Brandon Chang ("Takung"). Right photo: with Thomas Chung on the Sting concert. Nov. 2nd. ("Singpao". click to enlarge). See the SCMP article below. - On October 31st, Hong Kong CABLE TV celebrated its 10th anniversary. Michelle, together with Mr. Stephen Ng, Chairman, President and Chief Executive Officer of CABLE TV, and Mr. Tsui Siuming, Chief Operating Officer of i-CABLE, officiated at the launch ceremony for a new broadcaster's satellite channel, Horizon Channel. Horizon Channel offers a wide range of social and cultural, technology and entertainment programmes to viewers in the Mainland as well as overseas Chinese communities in the region. The channel has been awarded landing rights in hotels and selected compounds in China and is now available on the CABLE TV. Speaking on the mission of the channel, Mr. Tsui Siuming said Horizon Channel is a link between Mainland China and Hong Kong. "We hope it would serve to share our local production experience with the Mainland and promote cultural exchanges between the two places." Reportedly Michelle has agreed to guest host some programmes for the channel, such as interviewing Hollywood directors and actors. - I've posted an article from SCMP on the making of The Soong Sisters on the message board of MYOFC. Thanks Yvonne for the article. - As a memorial to Ms. Soong May-ling, Golden Harvest, the film production company of The Soong Sisters, will re-screen the film at UA Pacific Place, Admiraity, Hong Kong, starting at November 1st. Producer Ng See-Yuen and director Mabel Cheung had a press conference yesterday in Hong Kong. It will be an extended version which is six minutes longer than the original Hong Kong theatrical release. This version has a more completed ending. It was released in Japan and been shown in theatre for about two years and made a box record for the single film line release in Japan. The film was shot in China and Japan. Mr. Ng recalled that the film took three years to complete and it was difficult. He also said the film will be re-screened in Shanghai, where he runs a cinema. The film had its U.S. premiere in 1997 at Wesleyan College (Georgia) where the Soong sisters once studied (See the link "China's Soong Sisters at Wesleyan" at The Soong Sisters page). Ms. Soong May-ling was invited but she didn't attend due to health reason. She sent her lawyer to the screening. The film was also screened at another college where Soong May-ling stayed. - The last Soong sister, Soong May-ling (Madam Chiang), once the most powerful woman in China, passed away yesterday in New York city. She was 106. Article from "New York Times"
Hong Kong "Apple Daily" interviewed actress Vivian Wu, who played Soong May-ling in the 1997 film The Soong Sisters. She said she had been thinking for the whole afternoon about how she was making the film with Maggie Cheung and Michelle. She recalled that while making the film, the producer tried to arrange her to meet with Soong May-ling in person but didn't succeed. Producer Ng See-Yuen later showed the film to Madam Chiang, who praised the film although had a little bit criticism toward Wu's role. The film The Soong Sisters was filmed in 1996 and released in 1997. 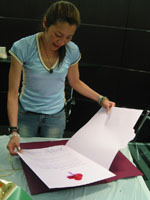 Director Mabel Cheung had to cut about 20 minutes in order to pass the censor of Mainland authority. It was a big winner at the 1998 Hong Kong Film Awards (12 nominations and 7 awards). Michelle was nominated as the best supporting actress. "Apple Daily" also quoted Michelle, who is in Malaysia at the moment, saying that Soong May-ling, who's brave and talented, is a legendary woman in Chinese modern history. - On October 20th, Huayi Brothers held a press conference in Beijing and officially announced that Michelle has signed an agreement with Huayi. At the press Michelle said her achievement in the film industry has been connected to both Hong Kong and the Mainland. Today's mainland film market has greater potentialities and strength. Signing with Huayi will give her more opportunities to work with those excellent directors and actors from Mainland China. Mr. Wang Zhongjun, the president of Huayi Brothers, famous Chinese director Feng Xiaogang (Big Shot's Funeral), and actress Li Bingbing (Michelle's co-star in Silver Hawk) attended the press. Asked if Michelle is going to work with Feng Xiaogang, Michelle said Feng Xiaogang is one of her favorite directors in Mainland China. She would love to have opportunity to work with him in future. Huayi owns in China a film production company, an advertising company, and a talent agency. Both Michelle and Huayi said there is no detailed arrangement on Michelle's work with Huayi yet but hopefully it will be settled soon. Asked about the film Hua Mulan, Michelle told reporters that the production is expected to start in September or October next year. They will invite Chow Yun-Fat as well as a number of mainland actors. In recent years Hong Kong filmmakers have been paying more and more attention to the mainland market. Hong Kong actresses Carina Lau, Rosamund Kwan and Sandra Ng had already signed with Huayi and reportedly Anita Mui and Anita Yuen will be the next. - Back in August, Michelle signed an agreement with "Huayi Brothers & Taihe Culture Agent Co., Ltd", mainland China. Huayi announced that the formal signing ceremony will be held in the afternoon of October 20th, at Liang Ma Qiao Hotel, Beijing. - Film music composer information for Silver Hawk. - Reports from Taiwan on Silver Hawk. - On October 11th, Michelle attended the Blumarine fashion show at The Landmark, Central, Hong Kong. - Silver Hawk update: a recent interview in which Michelle talks about the production and a bit on Hua Mulan. - Silver Hawk update: Australian-based Arclight will handle the international distribution worldwide of the film. - Video: Michelle at the World Heart Day, September 28 (9.8MB RealMedia, 1:34, in Cantonese). Many thanks, Frida! - In Silver Hawk: news and photos on a Silver Hawk party (photo at right from "Oriental Daily"). Michelle is currently working on the post-production of Silver Hawk as well as the preparation of Hua Mulan. - Phew... the domain name michelleyeoh.info is finally back. The hosting service for this site has been changed. From now on, Michelle Yeoh Web Theatre can be entered through either michelleyeoh.info or michelle-yeoh.net (they are mirroring of each other). The reason I obtained an additional domain name, michelle-yeoh.net, is that the new hosting service comes with a free domain registration but they do not register .info domain. Please do not use http://owl.usc.edu/~hding anymore, as the old server will be discontinued in near future (please notice that it may take weeks or months to reflect the changes on search engines). Sorry for the inconvenience and thank you for your patience! - Since numbers of people have asked where to get an autograph of Michelle and/or a mailing address for Michelle, answers to the questions are added in Q & A. - On Sunday September 28th, Michelle joined the walk for the fourth annual World Heart Day (WHD) in Hong Kong. She is a Goodwill Ambassador (Hong Kong) for the World Heart Federation and to support the aims of WHD, which is to increase awareness of cardiovascular disease risk factors and encourage people to adopt a healthy lifestyle. World Heart Day is held on the last Sunday of September every year and it is observed in more than 90 countries around the world. The theme for this year's WHD is "A Woman's Heart". Statistics compiled by the WHO from 21 countries show that of the 16.5 million who die each year of cardiovascular disease, more than half -- 8.6 million -- are women. Heart attacks and strokes kill twice as many women as all types of cancer combined. - On September 26th, Michelle attended the screening of Infernal Affairs II, which was the closing film at the three day FILMART (Hong Kong International Film & TV Market). Michelle, together with Jackie Chan, Andy Lau, Chow Yun-Fat, Maggie Cheung, Sammi Cheng, etc., are voted by buyers as ten "Most Desirable Hong Kong Actors and Actresses" at the Filmart. At the FILMART, reporters also asked Michelle about Chow Yun-Fat's participation in Hua Mulan. More details see Hua Mulan news. * Wallpapers from fans (thank you, Shannon). See Download -> Desktop or enter from Gallery -> Art Work. * Fixed RealAudio/Video streaming problem. - Update on Michelle Yeoh Birthday Special: BCF is preparing the "Thank You Certificate" that will be sent to Michelle together with the donation report. There were some unexpected delays since several checks didn't go through immediately. For those who had to re-do the donation checks, I'm sorry for the troubles you went through and THANK YOU for your special efforts! - You may not be able to use www.michelleyeoh.info to enter this site for a few days. I'm changing the domain name registrar. "Michelle Yeoh Web Theatre" can be entered at http://owl.usc.edu/~hding before the transfer completes. Thanks. - Silver Hawk Official Site is (partially) up! The FLASH site is pretty slow but at least the sections of "Characters" and "About The Film" are open. - On the evening of 16th, Michelle attended the premiere of Stephen Fung (Hong Kong singer, actor and director)'s charity short film on his own magic performances - Life Is Magical. The film will be shown at www.now.com.hk at 18th of September and the VCD of the film will be released next month. All money raised from VCD sales will go to the Children's Cancer Foundation. As a special guest, Michelle assisted Stephen Fung in his impromptu magic performance. Asked if she knows any magic herself, Michelle smiled and said in fact everybody's life is a magical life. Reporters also asked Michelle about the alleged financial problem in the Silver Hawk shoot. For more details see Silver Hawk news. left pic: Michelle was assisting Stephen Fung and amazed by his magic card show. Michelle's Hua Mulan is currently under pre-production. Michelle will definitely star in it. Ang Lee's CTHD prequel is (still) at the script writing stage. The scriptwriter Wang Hui-Ling has been working on it and she's supposed to meet with Ang Lee at 20th of this month in New York in order to finalize the script. Producer Hsu Li-Kong said the casting hasn't started yet. "We can't choose the actors before the script and the characters are fixed," said Hsu. There have been some updates on the prequel at this site's Crouching Tiger, Hidden Dragon -> "Novels & Prequel Notes". - Updates in Biography: list of Michelle's charities and major awards. - Save China's Tigers: The Adventurous Journey of the Two Chinese Tiger Cubs - "Cathay" and "Hope" from China to South Africa. - Anita Mui, a famous Hong Kong movie star and pop singer, held a press conference in the afternoon of September 5th in Hong Kong. After weeks of being chased by local paparazzi and numerous reports suggesting that she's ill, Anita Mui, with the firm support of her friends, decided to reveal the truth to the media. At 3:20PM, Anita, accompanied by Michelle, arrived at the hotel where the news conference attended by more than 100 reporters. She said she is suffering from cervical cancer but vowed to fight the disease and maintain her career. More than 20 celebrities, including Michelle and Jackie Chan, stood behind her in a show of support. The conference lasted about 15 minutes, followed by the touching moments when Anita embraced her friends, one by one. More than a hundred of fans of Anita Mui waited for her outside the hotel. They applauded and shouted their supports for her. Some fans presented flowers and other gifts to her. 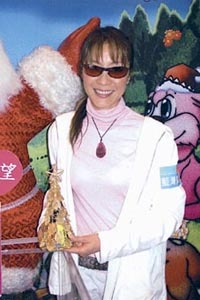 Anita Mui is a close friend of Michelle. She starred as the Wonder Woman in The Heroic Trio and Executioners, and performed the title songs. - September 1st, Hong Kong. Michelle, a patron of the Save China's Tigers Foundation, met with two Chinese tiger cubs who were on a stop in Hong Kong during their 7,000 mile journey from Beijing to South Africa for the first ever attempt at Rewilding Training (learning to hunt). Tigers, which are found only in Asia, are among the most endangered species in the world. In China, fewer than 30 South China tigers survive in the wild and a further 60 live in zoos. The foundation hopes to transport another five to seven tiger cubs to South Africa over the next five years and then introduce them and any offspring into a specially created reserve in southern China from 2008. 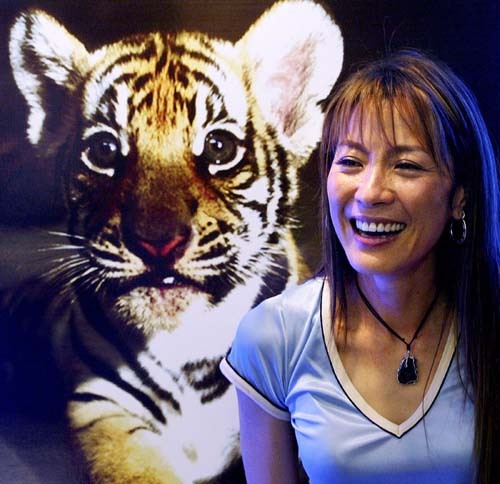 Michelle agreed to become a patron of Save China's Tigers last month after being introduced to the foundation. On the press conference, the host jokingly described Michelle and Tiger as "Beauty and the Beast". Michelle then pointed at the picture of a tiger behind her, smiling: "This is the real beauty." Born in the year of Tiger, Michelle said she felt certain special connections with tigers. IPOH-born international actress Datuk Michelle Yeoh had to skip the National Day celebrations because of her busy movie-shooting schedule. Nanyang Siang Pau quoted her mother Datin Janet Yeoh as saying that Michelle had to attend to an emergency and could not make it back in time. She was very busy as she alone had to manage hundreds of people, Janet said in a telephone interview. Janet said she was worried as Michelle had lost a lot of weight. "When she is back home, we have to pack her favourite food such as nasi lemak as Michelle attracts too much attention from her fans," the daily quoted her as saying. "She has turned down many requests from reporters who want to interview her as she wishes to spend time with her relatives and friends who will gather at our house," Janet said. - Update on Michelle Yeoh Birthday Special: BCF will finalize the name list of donors on the 5th of September. Please make sure your donation arrives BCF by September 4th. Thanks! - Frida, a Michelle fan from Taiwan, encoded from TVB News a video of Michelle at Kiehl's charity, August 13th. Download the clip (3.9MB RealMedia, 1:18, in Cantonese). Also in Video Clips: a longer and better quality version of Michelle's Malaysia tourism AD. Many thanks, Frida! - "The Star" (Aug. 23): Datuk Michelle Yeoh will be part of I-Berhad's contingent of famous Malaysians taking part in the annual National Day parade at Putrajaya on Aug 31. Famous Malaysians to take part in National Day parade. - Posters for Silver Hawk. - Movies -> Posters. A new section on a collection of posters for Michelle's movies. It's far from complete, though. - The Touch French official site: Le Talisman. - Today's "The Star" has a special on the "Miss Malaysia/World" pageant: The pageant's early days. It has two photos featuring Michelle as Miss Malaysia (thanks Yvonne). - Update on Michelle Yeoh Birthday Special: Sorry, we just discovered that the Direct Transfer to BCF's bank is restricted to Hong Kong only. If you're outside Hong Kong and wish to use wire transfer for the donation, you may do it through TT Remittance. The details can be seen at the birthday special page. (Note: if you don't see the update on that page, please refresh/reload your browser.). If you wish to make donation but none of the methods listed works for you, please e-mail me and we will see how to work it out. Thanks! - French poster of The Touch. 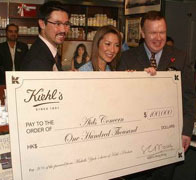 - On August 13th, Michelle attended a Kiehl's charity event at Pacific Place, Admiralty, Hong Kong. 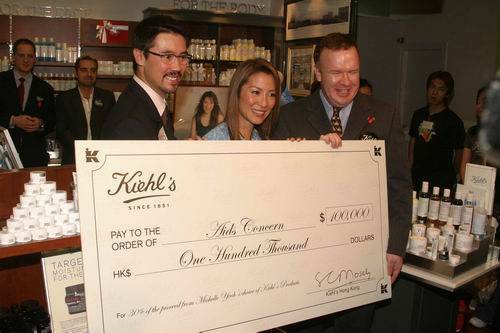 At the ceremony, Michelle presented the check of HK$100,000 from Kiehl's to AIDS Concern, for which Michelle and Kiehl's jointly launched a charity campaign back in April. Michelle is a patron for AIDS Concern, a non-governmental volunteer organization that offers AIDS support and prevention programs to the Hong Kong community. - Michelle and Thomas Chung attended the Real Madrid charity ball on August 7th, Hong Kong. Michelle Yeoh in "Crouching Tiger, Hidden Dragon": Hong Kong action star Yeoh was a double threat in this thrilling action epic from Ang Lee: wizard in the kickboxing and flying sequences and a compelling actress in the dramatic scenes. Whenever Yeoh was onscreen -- sorry, -- Chow Yun-Fat -- you couldn't look away from her. - Friends of Michelle threw a casual, private birthday party for her at the Mythical/Han office on the the evening of Michelle's birthday (August 6th). Special thanks to Anna for the precious photos and all the helps. We couldn't have made the whole event happen without her. Special thanks to Jacqueline and all in BCF for the wonderful special tailor-made birthday card, and all the efforts to make this special event happen. Special thanks to all of you, Michelle fans, for your constant supports - with or without donating $$. Last but not the least, we all thank Michelle for all she has done for us! If you haven't seen, Michelle has posted a personal message for all at The Touch official message board under the thread "HAPPY BIRTHDAY MICHELLE!" (as usual, she didn't sign with the name "Michelle" but you won't miss her post). Reminder: the birthday gift donation will last until the end of this month and Michelle will be notified the list of donors and tally. M i c h e l l e ! 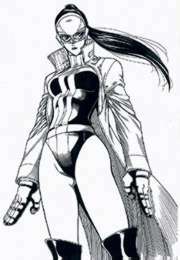 - Michelle successfully completed all the shootings of Silver Hawk (Congratulations!) and returned to Hong Kong at the night of August 4. - Update on Michelle Yeoh Birthday Special: PayPal method is up and ready to use. Note: if anyone is planning to send money order for the donation, please make sure it is an international money order that can be cashed in Hong Kong. Silver Hawk shooting is expected to finish soon. If there is no more delay (fingers crossed! ), Michelle will be back to Hong Kong one day before her birthday. 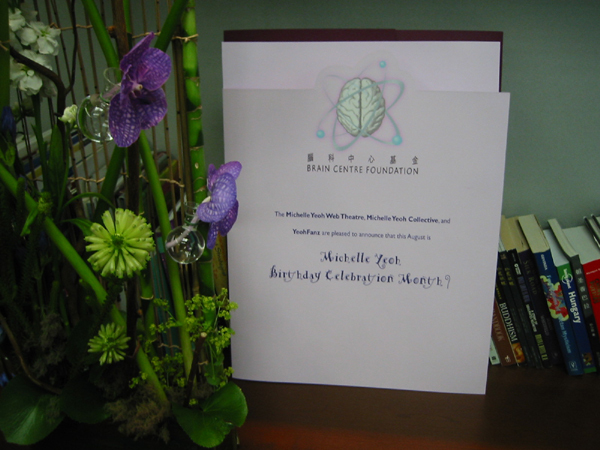 Our surprising gift to Michelle - a "Thank you" card from Brain Centre Foundation for the donation - will be presented at her birthday celebration. Michelle will not be notified the total amount we raised until September (I tried to set everything up a month earlier but sorry...). So we have one month to go - let Michelle know our care and love! There is no minimum amount required for this birthday special charity donation. My idea is, think how much you would spend/could afford assuming you're buying a birthday gift for Michelle. You could also do group donation together with your friends (attach a name list if you wish). Again, everyone is welcome to utilize the Guestbook on the birthday special page. Share your thoughts on this gift or simply write your birthday wish to Michelle. Yes, there is a chance Michelle may visit it. - A few more news photos are added at Silver Hawk -> "Production Photos". - Silver Hawk report and photos: shooting continues in Japan. Photo at right: Michelle at the National Museum of Emerging Science and Innovation, Tokyo ("Sing Pao"). - More on the Fox Magnificent Warriors DVD: U.S. fans can purchase the DVD at Best Buy for $9.99. Great picture quality. Original sound track and dubbed version. English and Chinese subtitles. In her new interview, Michelle talks about making of Magnificent Warriors, her experience with Owl vs Dumbo, and HK production vs U.S. production. The interview is more than 7 minutes. Extra features also include interview with Tung Wai (action choreographer), photo gallery, trailers, etc..
Michelle's birthday is coming. Many of us wish to celebrate this special day of this very special lady. So... this year, let's do it in a special way! In honor of Michelle's caring, generous nature, the Michelle Yeoh Web Theatre, Michelle Yeoh Collective and YeohFanz are jointly organizing a special charity donation to one of the charity organizations that Michelle regularly supports, the Brain Centre Foundation (BCF), under a special birthday gift account. The idea of making a charity donation as a birthday gift for Michelle was initially brought up last year by Zanita, a fan of Michelle. Zanita tried to contact one of the charities but we did not succeed to set it up. Now thanks to the help from Anna Leung of Mythical Films and Jacqueline Lee of the Brain Centre Foundation, this has been made possible. This will be a wonderful gift for our Michelle. We're all proud of our Michelle. Now let Michelle be proud of us! For details of the donation, please visit Michelle Yeoh Birthday Special. Donations can be made directly to BCF, starting today and throughout all of August. There is a Guestbook on the Birthday Special page that everyone is welcome to sign on and share your thoughts. You can also see some exclusive photos of Michelle at some of the BCF events. - Korean singer BoA dropped off Silver Hawk. For more details see Silver Hawk news. - MYC Message Board is back online. But unfortunately all data got wiped out so we have to start it over again. Come on guys. Also let you know that the birthday special is coming soon, hopefully at this weekend. Hang on! - Michelle's Royal Warriors will be screened by the Allston Cinema Underground (Boston) on August 6, 8:00PM. - A review of Fox's Magnificent Warriors DVD which is to be released on July 22nd. - Silver Hawk: news update. - Hi guys/gals, just let you know that I have not forgotten about Michelle's birthday, which is coming in a month. I'm trying to arrange something special - keep tuned :-). - Trailers & Clips: BAM has got us the entire fight sequence of Michelle's cameo in Twinkle Twinkle Lucky Stars. THANKS BAM!! Note that the clip is encoded with the latest DivX (5.0.5; previous AVI/DivX clips on the page is encoded with 5.0.3), you may need to install/upgrade to DivX 5.0.5 (download link at the bottom of the Trailers & Clips page) in order to play it properly. - Update on ComicsOne's CTHD vol.5: Barnes & Noble was taking pre-orders for the book and gave a release date of July 2003. But there seems to be some delay and now the publishing date is unavailable (thanks Tom). - The volume 5 of ComicsOne's CTHD comic books is coming out in July (thanks Tom and Frenda). Barnes & Noble has it listed. ISBN: 158899306X. 120 pp. Also, see a note on the prequel in Crouching Tiger, Hidden Dragon.